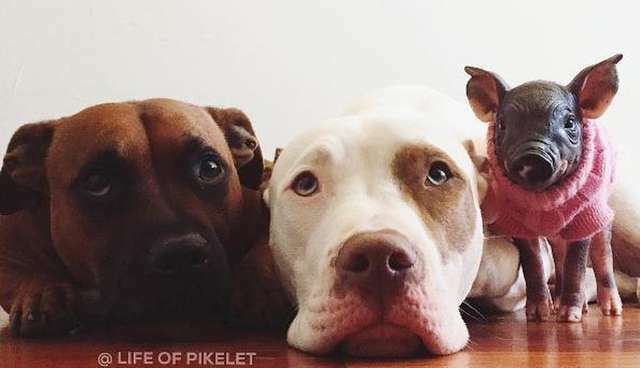 Pikelet and Patty Cakes, a pair of pit bull brothers from Australia, have had a LOT of foster siblings, and they've absolutely loved each and every one. "My husband and I have been fostering for approximately three and a half years now," their mom, Calley, told The Dodo. "We had both done a fair bit of volunteer work with a local rescue and I was running a dog walking business, so fostering seemed like a perfect fit for us with all our experience." ... and now, they have a piglet, who's so tiny she barely even looks real. Punk came from a litter of piglets who were being sold for profit, and Calley and her husband were asked to foster her because of their fantastic reputation fostering animals in need. "We felt terrible that people would want to buy a piglet and hand raise only to possibly either dump later on or kill to eat as food," Calley said. Little Punk is only about 11 days old, but she already has quite the personality. She adores cuddling, and especially loves having her back scratched. And of course, Punk is already pretty in love with her dog big brothers. "She's doing great with Patty, and she is starting to really play and climb all over him," Calley said. Pikelet is a little unsure of how tiny Punk is, but still loves her all the same. "Punk likes to follow Pikelet around, especially when he is playing fetch," Calley said. While Punk is quite the unusual foster sister, Pikelet and Patty Cakes welcomed her with open paws, and will love her every moment until it's time to send her on her way.